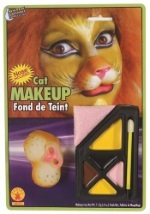 Show everyone just how well cats can dance in this toddler catarina costume! The girls costume comes with a pair of black fingerless mitts that are accented with a pink bow. The black, polyester dress has a plush tail that velcros onto the back. The bodice features pink ribbon accents while the sleeves are decorated with pink mesh and black ribbon. The pink and black tutu skirt has four layers of mesh with one black layer peeking out further than the rest (please note the skirt is only made from mesh and is see-through). The skirt is trimmed in pink and black ribbon and has an elastic waist for a comfortable fit. The costume is complete with a plush cat ear headband.